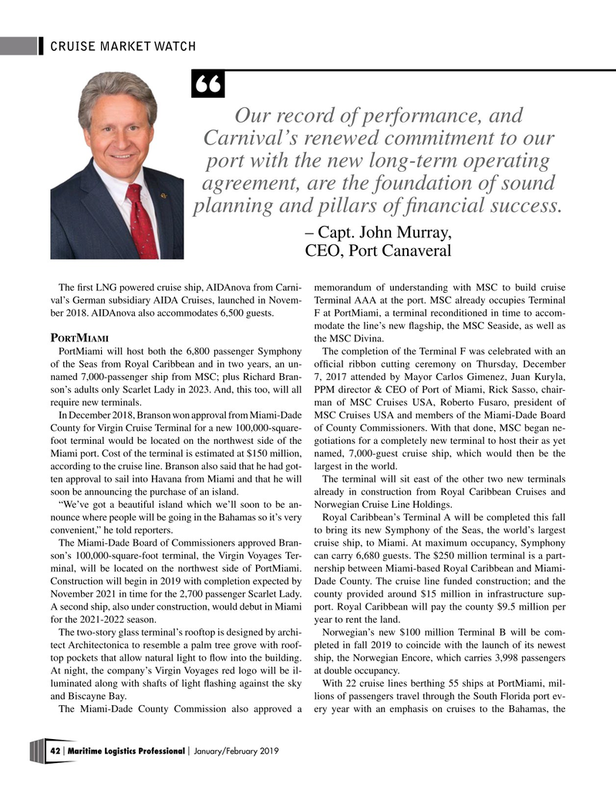 Carnival’s renewed commitment to our port with the new long-term operating agreement, are the foundation of sound planning and pillars of fnancial success. The frst LNG powered cruise ship, AIDAnova from Carni- memorandum of understanding with MSC to build cruise val’s German subsidiary AIDA Cruises, launched in Novem- Terminal AAA at the port. MSC already occupies Terminal ber 2018. AIDAnova also accommodates 6,500 guests. F at PortMiami, a terminal reconditioned in time to accom- modate the line’s new fagship, the MSC Seaside, as well as p morT iami the MSC Divina. Miami port. Cost of the terminal is estimated at $150 million, named, 7,000-guest cruise ship, which would then be the according to the cruise line. Branson also said that he had got- largest in the world. A second ship, also under construction, would debut in Miami port. Royal Caribbean will pay the county $9.5 million per for the 2021-2022 season. year to rent the land. At night, the company’s Virgin Voyages red logo will be il- at double occupancy.